safe and clean, suitable for indoor and car use. Click again, interval spraying, spray 3s, timing for 8 hours. Click again to turn off the spray. press again for 1.5s to turn off the night light mode. --Please don't use the function of humidifying spray while being lack of water. --This product can be added 1-2 drops water soluble aromatherapy, do not add oily essential oils to avoid clogging ultrasonic atomizer. --Please wash water tank and change water everyday to avoid breeding of bacteria and virus and to ensure that the use of premises fresh air. Cotton filter absorb water both of two side manually, it will be faster. --This product is with automatic power off function, it will stop spraying automatically when on the timing of the time. if you need to continue to use it, please observe the water in water tank and then press the function key to restart. --Please wipe the product with a soft moth instead of rinsing with bottom spring when faucet. --This product cannot be used by children under 10 years old. Mini size and lightweight air humidifier, perfect for use in babies, kids, office, living room, car or travel easily. 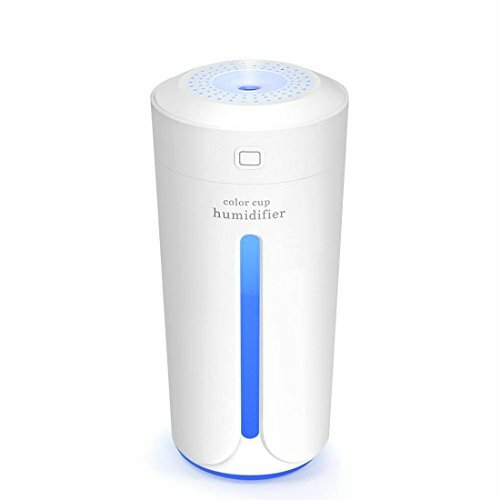 you can enjoy your humidifier anywhere and improve your life quality. 2 Mist Modes: Ultrasonic continuous spray and Interval spray mode (spray 3 seconds and then stop 2 seconds become a cycle), Click again to turn off the spray. Ultrasonic high frequency atomization, Refresh skin and can be taken as a skin care, keep skin healthy and moist, reducing radiation. 7 Color LED Changing Light For Your Choice: Press and hold the button 1.5 seconds, turn on 7-color auto changing mode. Press and hold button 1.5 seconds again, LED color lock (lock in any color when see it). Press and hold the switch 1.5 seconds again, turn off the light. Powered by USB charger, The mini mist humidifier can work just only in the case of power supply,such as USB adapter (500mA - 1A), The USB interface of computer, laptop, power bank. Portable humidifier, Auto Shut Off Function: 4 and 8 hour automatic shut-off Intelligent protection. once the water runs out, it will be auto shut-off to protect the device. No heat involved, no risk of burns, Quiet operation. If you have any questions about this product by YinQin, contact us by completing and submitting the form below. If you are looking for a specif part number, please include it with your message.